Please stand with us in ENGAGING more YOUTH! It’s been over a week since the success of our 1st Annual Farm-to-Table Celebration Dinner. But for everyone in attendance—whether staff, Board or friends—the highlight of the evening was hearing directly from a few of the youth in our programs. A graduate of our Food For Thought and Green Career Pathway programs talked about his fulltime employment at the company where he completed his internship. And, in 2019 he will move to France to work work abroad. He attributes much of his success to his experience in our youth programs. Meanwhile, his mother was beaming with pride all evening. In addition, two ladies shared about their summer experience in Trellis For Tomorrow’s pilot year of Youth Seed Enterprise. 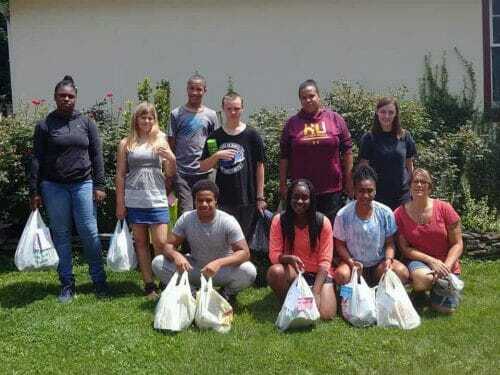 They appreciated the knowledge they gained about entrepreneurship, gardening and food justice—but more importantly they valued the sense of community that was fostered by their participation in a shared initiative to bring food security to their community. The two ladies explained that after the summer, there was a period of time they felt a void and deeply missed the close bonds they had formed with others in the group. These examples are what fuel our work—and your support enables youth to have more opportunities like this. Every day, Trellis Tomorrow works to engage young people by creating transformative, real-world opportunities through teaching critical life skills, promoting personal growth and connecting youth to mentors, their communities and meaningful employment. Please join us in engaging youth. By giving just $10, you can help us engage youth and meet our #GivingTuesday goal of $5,000 goal on November 27th. If we meet this goal, contributions will be matched by the generosity of an additional $5,000 gift to Trellis. Your #GivingTuesday gift will put us on course to reaching our #GivingTuesday goal on November 27th! Please stand with us in ENGAGING more YOUTH by making a donation on #GivingTuesday!